3. Luxuriate in metaphors you don’t understand. 4. Take potshots at “foundationalism,” “propositional truth,” and “modernism,” without defining, explaining, or actually arguing against them. Fourth, we respect the desire and responsibility of our critics to warn those under their care about ideas that they consider wrong or dangerous, and to keep clear boundaries to declare who is “in” and “out” of their circles. These boundary-keepers have an important role which we understand and respect. If one of your trusted spiritual leaders has criticized our work, we encourage you, in respect for their leadership, not to buy or read our work, but rather to ignore it and consider it unworthy of further consideration. We would only ask, if you accept our critics’ evaluation of our work, that in fairness you abstain from adding your critique to theirs unless you have actually read our books, heard us speak, and engaged with us in dialogue for yourself. Second-hand critique can easily become a kind of gossip that drifts from the truth and causes needless division. “In the context of this debate, it is important to remember that postmodern theory does not support the rejection of rationality but rather supports rethinking rationality in the wake of modernity. This rethinking has resulted not in irrationality, as is often claimed by less informed critics of postmodern thought, but rather in numerous redescriptions and proposals concerning the understanding of rationality and knowledge. These postmodern ideas produced a more inherently self-critical view of knowledge than modernity. It seems to me that Franke is missing the point here. Descartes didn’t establish his ergo cogito sum because he was a skeptic but because he was a Catholic seeking common ground to argue with an increasing number of atheists. The pre-modern assumption that God’s knowledge was the basis for all true knowledge was already on its way to being discredited (see link). To continue down this path, Dr. Myron Houghton pointed this one out to me. Helm provides clear insight into understanding the issues involved in the foundationalist vs. non-foundationalist battle. Perhaps Franke, following Westphal, is committed to this: If someone knows (but does not Know), then such knowledge ‘inevitably leads to forms of oppression and conceptual idolatry’? Now consider Jesus. He is God the Son who has assumed human nature. He is situated in a context, first century Palestine. Does he know, or Know? If he merely knows, then such knowledge leads inevitably to forms of oppression and conceptual idolatry. Not the sort of result we want, I take it. But if he Knows, then it seems that Franke will have to say that Jesus did not have a context, or was somehow able to neutralize its epistemological effects. I leave the reader to sort out this tangled web. Whether or not these knots can be untied, I take it that Christians (including Franke) want in the main to say that claims to knowledge, if they are from the lips of Jesus, are not simply claims to knowledge but are rather more than that, but that they are not at all oppressive claims to power. But it’s not clear how, under Franke’s auspices, we are allowed to say this. It does strike me however that Helm and Franke really aren’t speaking on the same level and Franke is really speaking non-sense. Franke says that a non-foundational approach will still be distinctively “Christian” (Dr. Myron would say “blick,” his word for a meaningless word). 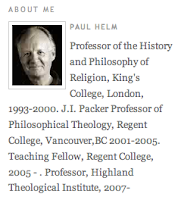 And Helm calls him a foundationalist because of this claim, although Franke really doesn’t mean “Christian” as Helm understands it so the conversation is useless… or does he really mean “Christian”? Barth’s ergo cogito sum (his “foundation”) seems to be the person of Jesus Christ, but on who’s authority does Barth know Jesus Christ? How much does he really know about Jesus Christ? Isn’t that at least a “weak foundation” (see Plantinga on “weak foundationalism” here)? After all is said and done doesn’t Franke really just desire the deity of the community in establishing meaning. Modernism and liberalism colide and we are left with the struggle for man’s sovereignty in the cotext of a million different voices and it remains to be seen what their soveriegn consensus will be. What I do know is that Franke will probably call it Christianity and Helm will probably not. Again, it must be stressed—for this is where great misunderstanding exists—soft postmodernism is not built upon the denial of truth itself (a metaphysical concern), but with our ability to know the truth (an epistemological concern). As well, soft postmodernism has brought focus back to our method of doing theology. With its distrust in tradition, it has made the church look with suspicion upon unfounded traditions. Fundamentalism started as a good thing and then became pharisaic with convictions preached from the mountain tops that are not found in Scripture. “Don’t drink,” “don’t go to movies,” “don’t smoke,” and “don’t dance” became what being Christian was all about. 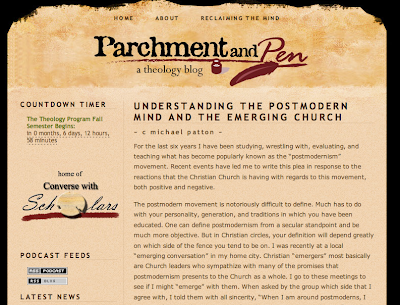 Postmodernism unmasked these negative aspects of the fundamentalist church. Postmodernism is in rebellion against traditionalism, and this is not such a bad thing. In sum, hard postmodernism should be seen as a threat. It is not possible to be a hard postmodernist and be a Christian. Soft postmodernism on the other hand presents the church with many lost virtues of grace and irenics (theology done peaceably). For this we can be thankful. But we must guard the truths of Scripture with the conviction that the evidence has presented. Our traditions may or may not be wrong, but that is for the evidence to decide. There also are non-essentials that need to be spoken about with conviction, even if we might be wrong in the end. In short, let us be balanced in our understanding of the issues on the table and let us not lose the conviction that the truths of Scripture produce. Tony Jones recently gave a paper on “orthodoxy” at the 2007 Wheaton Theology Conference. A book will come from the conference, but the editors decided not to include Tony’s paper, which Tony is not so happy about. “While Vincent exhorts us to hold fast that which has been believed everywhere, always, and by all, you’ll have about as much luck finding that elusive thing as you will be hunting Jackalope in South Dakota. No such universal, a-contextual orthodoxy exists” (p. 15). “Orthodoxy is a happening, an occurrence, not a state of being or a state of mind or a state-ment” (p. 20). “There is no orthodoxy out there somewhere, only here, in me and in you and in us when we gather in Christ’s name” (p. 23). “There is no orthodoxy without orthopraxy. It doesn’t exist. People may talk about it, but they also talk about unicorns” (p. 24). “There is no song until it’s sung—it’s just words and notes on paper. There is no strike until it’s called by the ump—’It ain’t nothing till I call it.’ And there is no orthodoxy until it’s lived. It is an event that happens when we gather to worship, when we change a diaper, when we read a book, when we present a paper” (p. 24).